Since it’s National Pet Week, we thought it’d be a good time to discuss some of the more gritty details many pet-owners don’t know when they first get their pets. Animals (humans included) are messy creatures; they love leaving around toys, tracking in mud, and every once in a while, having an accident on your new carpet. Here are some essential things every pet-owner needs to know. Your pets body is like their home, and as much as they might self-groom, there are a few things you need to help them with on a regular basis. Minimize the hair and dander in your home by keeping your pets bathed and groomed. A weekly bath with some all-natural pet shampoo will greatly reduce the work you have to do later on, and it’s also a great opportunity to get rid of any fleas. Microfibers are excellent for quickly drying them after the bath, so they don’t get water all over the place in a rolling and shaking frenzy (or in the case of cats, a quietly grooming frenzy). Take your pet outside with a good de-shedding brush and scrub them down. They usually love getting rid of all that hair and dander, and getting itched and massaged in the process. Be sure to properly dispose of as much hair as you can. And to think, all that would have been on your floors and furniture! Keeping them clean is a great way to prevent a mess, but keeping them in good spirits can also help to prevent other messy situations. To dogs, you’re the head of the house and leader of the pack, so it’s important that you give them a stable environment. 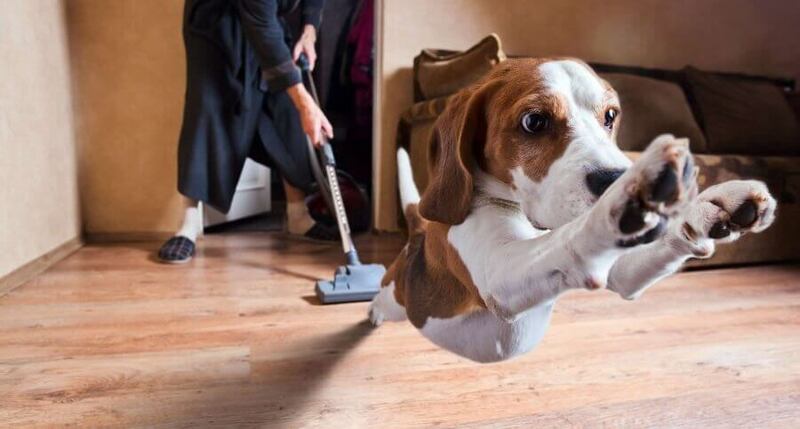 General cleaning around the house helps keep stress levels low, and leaves less reasons for a dog to chew something up. Pet hair is notorious for finding its way into every crack and crevice of your home, so we must be diligent if we’re going to keep things spotless. Because of wind currents created by open windows, ceiling fans, and just walking around, pet hair will often accumulate in corners, under furniture, and other hard to reach places. A good rule is to do a quick sweep once a day, and vacuum floors and carpets once a week. Don’t forget to wipe surfaces Before vacuuming for a tip-top job. Not only will you eliminate hair and dust, but if you deal with fleas, this will help to eliminate breeding grounds and flea larvae. If you want to go the extra mile, make sure you throw the window curtains in the wash and vacuum the couches, as these are common breeding grounds as well. You also want to wash their bedding often. Make sure you have bedding with a cover that is washable as well as waterproof (for any accidents that may occur). When dealing with accidents around the house, always start by either absorbing it with a microfiber, or picking it up with toilet paper. The microfiber can be washed, and toilet paper can be disposed of in the toilet to avoid a smelly trash can. Microfibers are incredibly absorbent, and work great on carpets and couches to soak up most of the moisture. Then use an all natural spray for just this occasion, let it sit for a few minutes, and soak it up again before letting it air dry the rest of the way. To help prevent fleas from breeding, you can put a little diatomaceous earth in corners or inconspicuous locations. Learn more about how D.E. works here. Leaving pet food in open bags can attract mice and other bugs. Keep it clean and organized inside a large, sealed container. Make sure you have a good matt for when they come back inside on a rainy day, and keep wet-wipes handy to clean off any mud and dirt. Keep their toys washed and cleaned, and all in one place like a basket. Some dogs can even be trained to put them back! Messy litter box? Get a nice mat for underneath. It catches most of the rogue litter and can be easily shaken out. Remember– always use hypoallergenic, natural products when you have pets (and when you don’t) because the chemicals found in generic products are harmful to touch and to breathe. As much as pets might struggle when it’s bath time, they truly love being clean in a clean environment, and will love you for it! And you’ll be able to breathe easy without all that hair flying around and sticking to your clean clothes. Follow these tips and you’re on your way to a cleaner, healthier, happier home for you and your pets.